The Volusia County Sheriff’s Department has confirmed that one suspect is in custody following a bomb scare at Daytona Beach International Airport that forced the evacuation of more than 200 passengers on Friday morning. Sheriff Mike Chitwood said the man, identified as John Greenwood, entered the airport at around 6 a.m. clothed and with a bag. He entered a ladies bathroom that was still under construction, left the bag behind a hole in some sheetrock, and exited the restroom without any clothes. The suspect then attempted to escape onto the tarmac via a baggage carousel, where he was Tasered and apprehended. 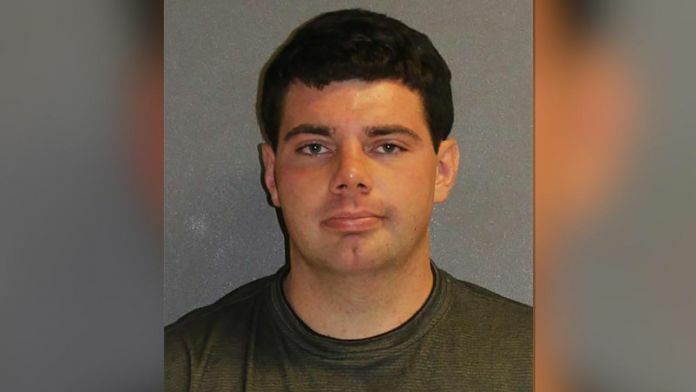 The Volusia County Sheriff's Department shared footage from the incident, which shows officers finding the suspect, asking him repeatedly to get on his stomach, and then Tasing when it appeared he was not complying. Officers can also be heard asking what the suspect is "on" after he was apprehended. Chitwood said the naked suspect yelled something to the effect of, "We gotta get out of here, I planted a bomb in the bathroom," and footage shows the suspect saying something is going to "blow up." Airport officials confirmed that the suspect had indeed stuffed something into the wall, and contacted the police and bomb squads. A bomb unit confirmed the bag was not dangerous and performed a secondary sweep before allowing travelers to reenter the airport. They had been evacuated earlier to the short-term parking area. Officials said no one was hurt during the incident. Chitwood revealed Greenwood was "well known" to local police and had been arrested a number of times previously. The sheriff further stated that Greenwood was taken to a hospital. Chitwood added that the suspect would likely be facing a "slew of charges," including federal charges. "This is all federal, what he did here," Chitwood said, adding that he believed the FBI would be investigating. A spokesman for the airport confirmed that passengers were admitted back into the airport an hour and a half after they were evacuated. The airport was said to be re-accommodating travelers throughout the ordeal. WARNING: Clip contains graphic footage. Viewer discretion is advised.